The current issue of muckraking journal Private Eye reports that Heathrow Airport will have shiny new equipment for screening passengers installed with the help of several Israeli firms as part of preparations for next year’s Olympic Games. The sporting event affords an opportunity to run a “live test” on the Total Airport Security System (TASS), a 14.5 million euro ($21 million) project mainly financed by the European Union. As it happens, details of the project were announced almost exactly a year ago. 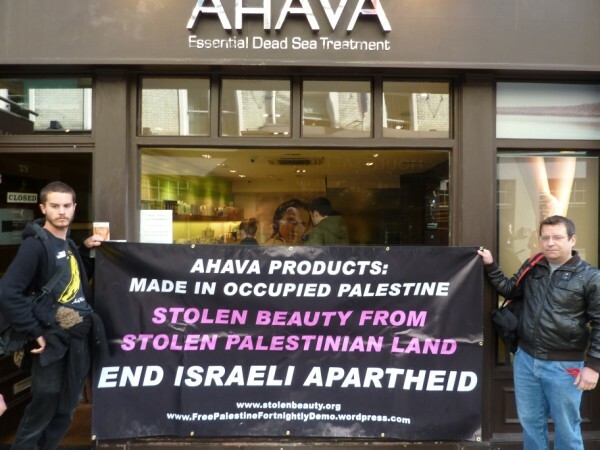 Ahava's goods, processed on stolen Palestinian land, are becoming too hot to handle. Leading British retail business John Lewis is now refusing to stock this toxic brand. Canadian retailer The Bay has also confirmed that it had also discontinued sales of Ahava products. Editors note: the full findings of the London Session have now been released and can be found at http://www.russelltribunalonpalestine.com/en/sessions/london-session/findings. Occupied Palestine, 30 November 2010 - ‘May this tribunal prevent the crime of silence’, pleaded intellectual Bertrand Russell at the first meeting of the citizens’ War Crimes Tribunal that investigated US war crimes during its war on Vietnam.